The former Super Sireyna of Eat Bulaga, now a popular lawyer on social media because of his trending 'Open Letter,' has new letter to attack the current issue on 'Anti-Duterte Ad' produced and paid by Sen. Antonio Trillanes to ABS-CBN Kapamilya network. According to Atty. Rivera, he did not intend to watch the black propaganda but it did not escape social media. His letter is intended for the people of Liberal Party specially the presidential bet Mar Roxas and to the network with greedy PR people. WHEN IS DECENCY IN BAD TASTE? I really did not intend to watch the black propaganda against Duterte because I knew it would be nasty. Even when LP people are saying na disente sila, I knew how low they would go. And based on my experience, the richer you are, the more unbecoming you can be, if you decide to do it. When an ordinary thief steals, he hides it from public view. When a rich man steals, he just buys a new car to celebrate his venture. But the ad did not escape social media. And true to form, the intended black propaganda backfired. It did not damage Duterte. Why? Everyone knew Duterte is a grandfather who is loved heavily by his grandchildren. And his grandchildren are not the spoiled and bratty type. He has both Muslim and Christian grandkids. They are the usual children you endear. The same ones used in the ad. While PNoy and his minion, Mar are not grandparents. Mar has a kid and Pnoy has Josh and Bimby as the nearest thing to offsprings. They cannot attack Tatay Digong as a poor example to children when they are not themselves real fathers or grandfathers. Mar has one son, who is not living with him. The President has not even stopped being a son to Kris and Ballsy. And recently, ABS-CBN issued a statement that it had nothing to do with the ad. An ad that used children who does not even know the gravity or truthfulness of their statements to somewhat change the minds of Duterte supporters or the undecided. First, you were paid to air the ads. The ads would not have reached its target market if not because of you. Second, the clips used were from your news reports. I know that your company code of ethics prohibits the use of your materials for unethical purposes. So, either you sold it or allowed it to be used. You have everything to do with the ad. And I will just leave it to the people and to the advertisers how to deal with you. Did the ads reap the expected benefits for those who paid for it? NO. The reason people are voting for Duterte is that most Filipinos want to feel safe for their children. And we do not care if we leave it to the hands of a man who talks like a criminal, thinks like a criminal or acts like one (as you so rightly want to insist) because it takes someone who knows a criminal to stop them. KAYA NGA KAYO GALIT NA GALIT AT TAKOT NA TAKOT. So to use children is just reinforcing how right we are. If you have no qualms exploiting children just to hold on to power, then that is the lowest it can get. And I have just lost respect at everything and everyone your party stands for. I will NO longer support all the Liberal Party candidates I openly supported in the past unless you openly condemn the ads. I am asking people not to vote for any candidate who is willing to use children to do the dirty work for them. And this time, it is no longer political. IT HAS BECOME A PATRIOTIC ISSUE. Because for most of us, this is against not just Duterte but the Filipino people. Now let your silent majority roar. We want to hear it! 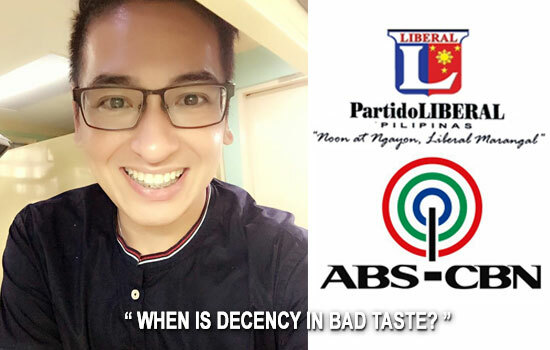 Comments or suggestions about "An Open Letter to LP people & ABS-CBN: 'WHEN IS DECENCY IN BAD TASTE?' by Bruce Rivera" is important to us, you may share it by using the comment box below.